We awoke to the tail end of a night of persistent, heavy rain. The forecast predicted more, but soon after setting off the weather began to clear. 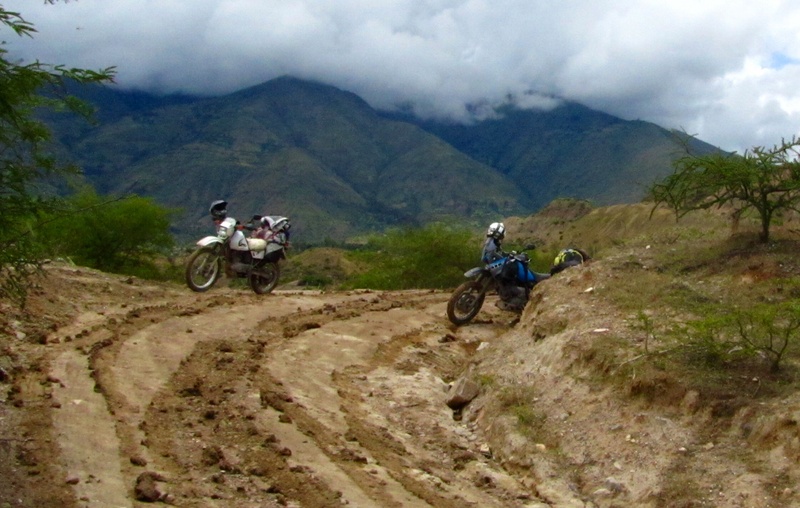 Our new motoquero friends, Mario and Bacho, had told us the route to Huancayo was paved all the way. Indeed, they had previously ridden it on their cruisers. So I anticipated an uneventful and steady ride ahead of us. Wrong again. 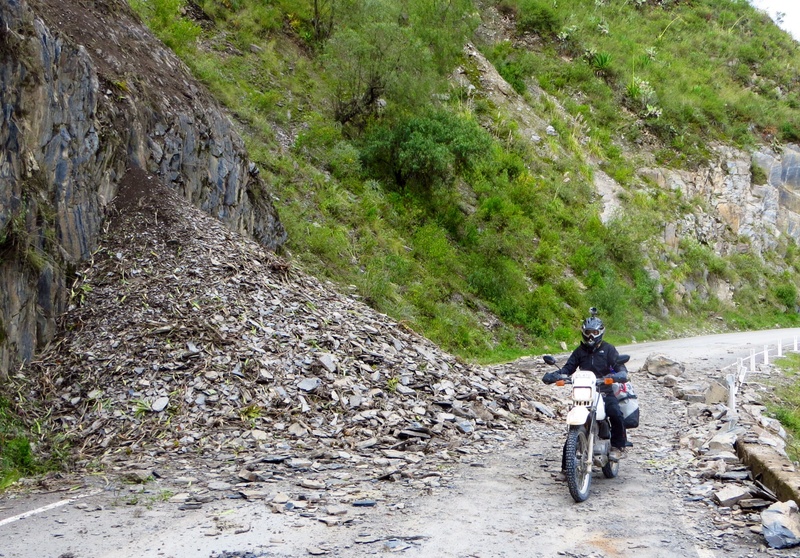 After passing through the small town of Huanta, the road along which the GPS was steering me turned to gravel. This is not unusual in South America. Often a good asphalt route will suddenly turn to ‘ripio’ for a few hundreds metres or perhaps a few kilometres before the hardtop returns. (Why this is so, I have yet to decipher.) However on this occasion, the route started to deteriorate as it gently switch-backed down the hill into a broad river valley; the previous night’s rain had turned the dirt road into very slippy mud and vehicles ahead of us had churned it up. We pushed on, in many parts walking our bikes gingerly through the more difficult sections. Eventually we reached a point where I realised we could now only continue forward – the mud and the steepness of the slope would thwart any attempts to retrace our steps. I got stuck in a deep rut. Then I dropped my bike as is casually slid away from beneath me on a gentle slope. I was starting to prepare contingency plans if these road conditions continued. 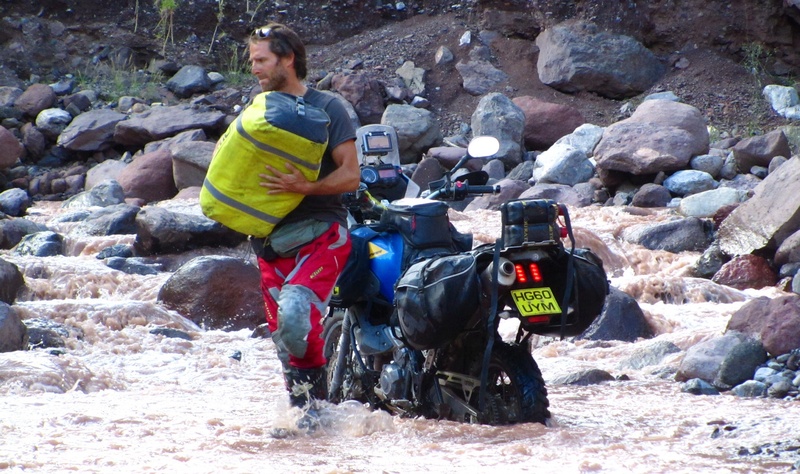 Perhaps we would need to secure the services of a 4×4 pickup to carry the bikes through the mud as I had to do in Patagonia. Or maybe a halt for a few hours in the hope that the sun would dry the worst parts. Fortunately, this turned out to be unnecessary. A local travelling in the other direction on his trike stopped and told us we only had another kilometre or so until we reached the ‘main road’. We pushed on without further incident and joined this so-called ‘main road’, which was no more than a compacted (but thankfully dry) mud and gravel affair. 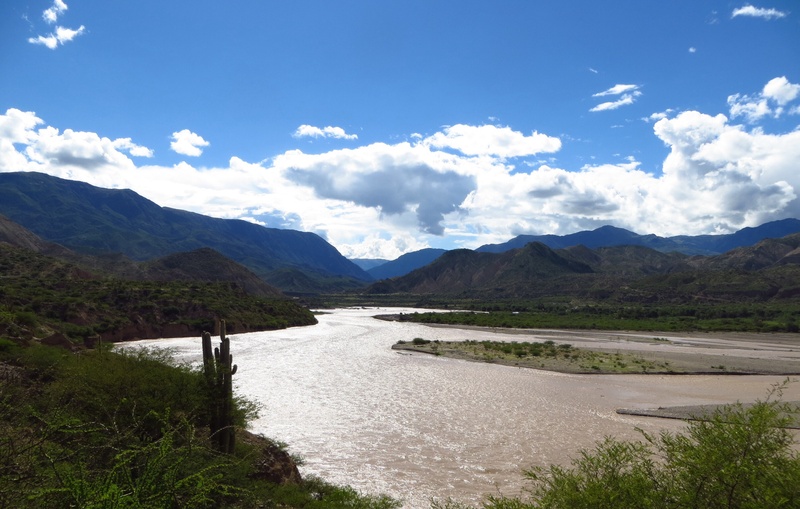 The road to Huancayo runs along a stunning valley for maybe a hundred kilometres – wide at first but becoming increasing narrow and sheer-sided further upstream. Roads such as this one, which hug the side of the valley, are invariably cut by the mountain streams tumbling down the sides of the valley. We had been warned that some of these streams were now swollen, fast flowing and deep due to the rains. Rockfall and landslides also added to the obstacle course. It wasn’t long before we came across the first of these fords. The stream had spread out across perhaps thirty metres of the road where it took a sharp bend, the water thick brown with mud. I went in first, trying to predict the course of the road beneath the water – and failing. I went too far into the apex of the corner, found deeper water and gravel below, and dug my rear wheel deep into a trough. My attempts to free the moto were in vain. So with boots full of water, I unloaded all my luggage from the bike and eventually man-handled it free. Pau then crossed using the right line, as nonchalantly as a kid pedalling a bicycle around a park. With delays earlier in the day due to a series of roadworks, as well as a time-consuming river crossing, we were making slow progress. Huancayo was still 150km away. As dusk approached, we came upon another significant ford blocking the way. This one had a more angry look to it. The current close to the home bank was strong and had cut the edge of the stream away, leaving a drop from the road into the water. 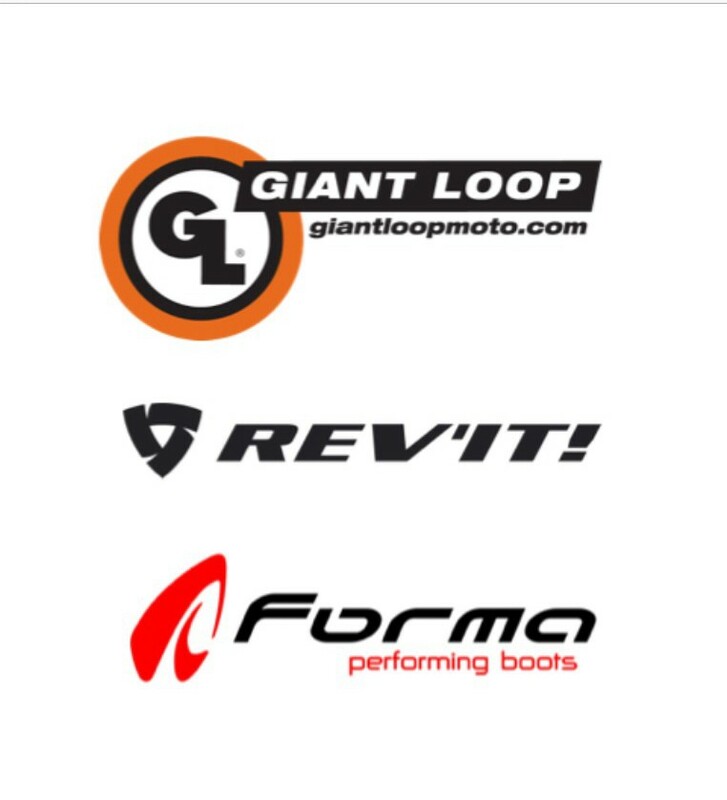 With already wet feet, I waded in to check the condition of the stream bed – one large, unseen rock can stop a bike in it tracks or deflect the front wheel, resulting in a wet bike and worse a wet engine. I thought that a fast entry into the water, using momentum to carry the bike through the deeper, rockier section, would do the trick. Pau was less convinced. So after riding the Tenere through, I hopped on to Pau’s moto and took it across too. It was a breeze on the nimble, lightly-loaded Suzuki – 125kg all up compared to about 230kg for my mount, fully loaded. This left Pau on the far bank, needing to be reunited with her machine. As she removed her boots and socks and prepared to wade across, a truck rounded the corner. Perfect timing. No Peruvian trucker is going to deny assistance to a long-haired damsel in distress. I met her as she jumped out of the cab on the far bank, grinning and with very dry feet. After another hour of driving, we finally reached the village of Quichuas where we could eat and find a bed in a simple hostel. It rained all night and long into the following morning. 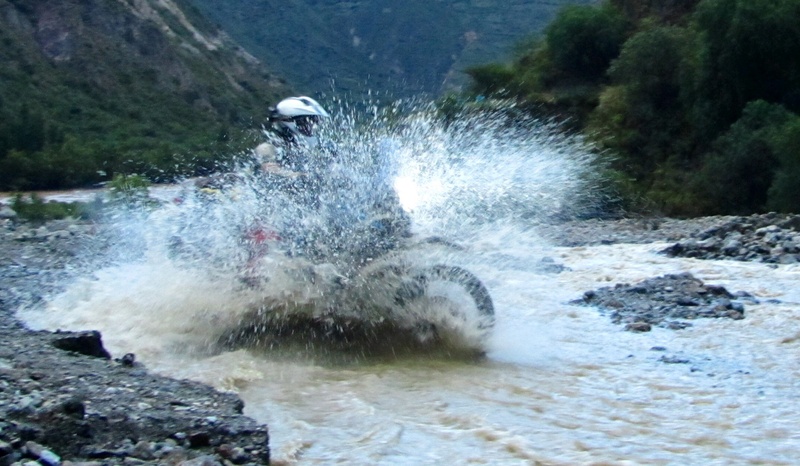 We did the sensible thing and waited for it to stop before setting off for Huancayo after lunch. The respite didn’t last – it was raining when we arrived in the town, and it still is as I write. We have a long way to go through the Peruvian mountains. If the rain doesn’t ease up, I suspect adventures aplenty await us. I grew up in Ayacucho, so I clearly understand that ‘special’ feel that it has! It will be great to meet you both in a few days here in Huanuco! My wife Sara rides her Honda XR250 Tornado so I’m sure will connect with Pau.